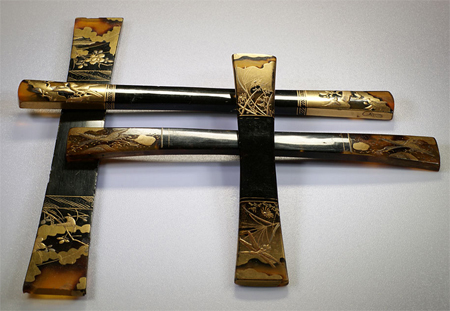 Earlier Meiji kogai sticks were long and flat, with gold maki-e decorations on each edge. Edo kogai sticks were shorter and thicker, carved just at the top. 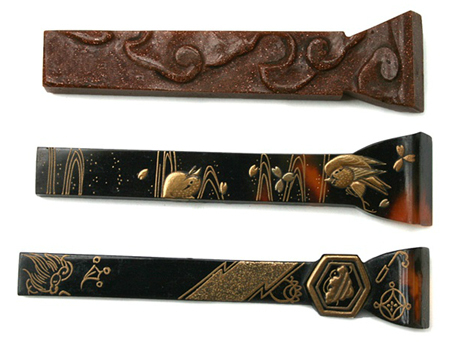 These Meiji tortoiseshell sticks come from The Creative Museum, while the Edo lacquer sticks reside in The Miriam Slater Collection. This extraordinary early Meiji kogai stick belongs to the Walters Art Museum in Baltimore, MD. 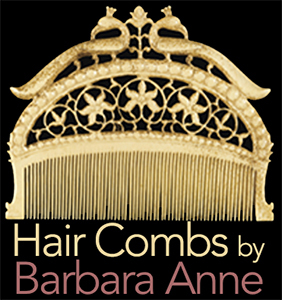 It is gold, split like two sticks of bamboo, and depicts a sparrow flying through the trees.